For a fence company that you can be sure will provide top-quality products and install them precisely, turn to Chesley Fence & Deck. We have served residents in Waterloo, Illinois, and the surrounding areas since 1967 and no other company has installed as much fencing as we have. What’s more, we’ve earned a reputation as the most trusted name in the business, which is evidenced by our long list of satisfied customers and A+ rating with the Better Business Bureau. Cedar fencing – We use true 2×4 rails of premium Western Red Cedar that is exceptionally resistant to warping and cracking. Vinyl fencing – This American-made fencing is more durable than similar products you will typically find with any other fence company. Plus, the parts fit together seamlessly for enhanced aesthetic appeal. 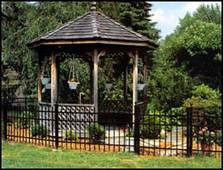 Ornamental aluminum fencing – Screwless panels give this fencing a seamless appearance. Plus it undergoes an 11-step powder coating process to prevent cracking, chipping, and fading over the long term. To learn more about why Chesley Fence & Deck is the best fence company to turn to for superior products and service in Waterloo, IL, contact us today.